That pretty much sums up my weekend at the inaugural Challenge Atlantic City. I had a great few days leading into the race. 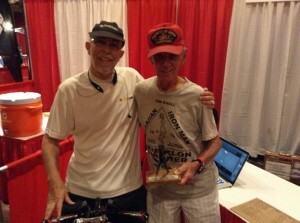 I had an opportunity to meet and hang out with some good friends and an opportunity to meet new ones – some legendary in the sport of triathlon, like six-time World Champion Mark Allen, two-time World Champion Chris McCormack, the mightiest of the mighty Rinny Carfrae and Frank Day and Tom Knoll who were original finishers of that 1st “Ironman” event back in 1978. 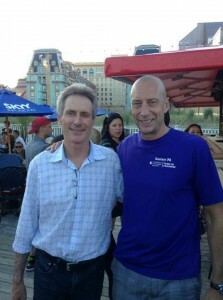 I had a chance to hang out with one of the most recognized voices in endurance sports, Whit Raymond. Nobody brings a finisher across the line like Whit Raymond and his partner Mike Reilly. I was healthy. I felt sufficiently trained (although I was playing the course familiarity card just a little). The race directors Stephen DelMonte and Rob Vigorito are good friends and well known and respected for their increible event experiences. I had part of my family present but was missing our Arizona crew who couldn’t make this trek. All systems were set to GO mode. I was excited to be a part of this inaugural and soon to be epic race put on by the Challenge Family. I felt the stars were aligned. My plan unraveled two hours and twenty minutes from the start. While I’m not one to make excuses, there were a couple of unforeseen situations that got inside my head a little and played a part in my day ending early. And this is Ironman so I know better to always be prepared and to expect and plan for anything and everything, even the most improbable. I’m not new to this game. In fact this should have been my 12th finish. But sometimes, things just turn sideways. So you look for the lesson, you make the adjustment, and you move on. Overnight water temperatures were a perfect 66-72 degrees the week leading up to the race. “Perfect” I thought. This should be a nice wetsuit legal swim in the calm back bays of Atlantic City. Somehow, the water temp shot from 72 to 80 on race morning. While we all know this isn’t possible, and clearly something was wrong with either the pre race readings, or the race day reading…it is what it is. These are the rules that we all must play by and I have nothing but respect for the USAT officials who worked Atlantic City. The bottom line is that 80 degrees meant no wetsuits were allowed unless you wanted to forego any potential awards and winnings, and go off in your own wetsuit wave after all other waves have gone. Given the fact that there was no way the water was really 80 degrees, and I didn’t know all of the nuances and characteristics of those back bays, I opted to wear the wetsuit. What happened in those waters remains a mystery to me. The front half of the swim was manageable. Challenging, and a little slow, but manageable. My ironman swims have been as fast as 1:20 and as slow as 2:00 depending on the water. I assumed (predicted? Anticipated? Hoped for? ), I would probably swim approximately 1:45, and I would have been happy with that. It wouldn’t be as easy as say a Lake Placid swim which is probably the easiest swim out there, but I thought it would be “ok”. The 2nd half of the swim was a nightmare. Not in terms of it being fearful or dangerous, just never ending and frustrating. I have never seen currents like that. There was one entire section with two turn buoys that were soon named “treadmill buoys”. I saw countless people cut that buoy short simply because they could have spent the entire day out there and never reached it. I saw the current slam others into buoys so hard that their legs became entangled in the anchor lines. I didn’t cut that last buoy. But I paid a time price in playing clean and honest. The currents in the section, and a few others along the back half were overwhelming and for the 1st time in my racing career I watched the 2:20 swim cut off time expire before my eyes, along with about 60 other people. There were many stretches where I was either swimming in place, or even losing a little ground. Misery tends to like a little company so I did take some comfort in hearing that most to all swim times were off 20-30 minutes, and the later waves faced a stronger current than the earlier waves. Thus forcing me to second guess that wetsuit decision! But do the math, if I expected to swim 1:45ish and times were 30 minutes slower, that doesn’t leave me much wiggle room. Such is life. Or no. Such is SPORT. This stuff isn’t real life, it’s fun, it’s adventurous, it’s optional, and it’s sport. And I still love it. And again, I’m not making excuses for anything. I could have, should have done some things differently that may have led to a different outcome. I have no complaints and only a couple of regrets that will quickly fade or become opportunities. 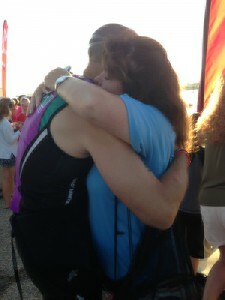 When I look back on this, I will remember having a great weekend with an incredible support crew. I will remember a crappy swim. I will remember being proud to have been part of this inaugural event and can now say that I am looking forward to next year. And I will remember a great vacation following the race. 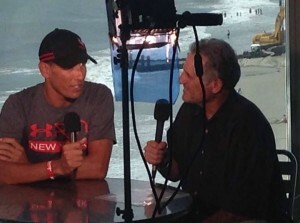 Until then, my redemption awaits me at Ironman Maryland in September. My hat goes off to all parties involved with making this race happen. Putting on a new race is hard. Putting on a new triathlon is extremely complex. Putting on a new iron distance triathlon has more moving parts and more things going on behind the curtain than you can possibly imagine. 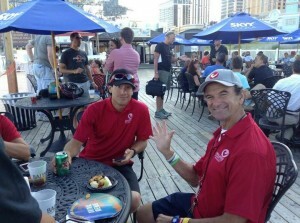 Kudos to race directors Vigo and Delmo, the race crew, all volunteers, and the Challenge Family for making it happen. On a side note (and many will call me crazy for this), last week I turned down an opportunity to race in Kona this year with Team in Training. I had a couple of great conversations with the National Director and while we both recognized the great opportunity for TNT and for me, the timing just wasn’t right. I would want a little more than 3 months to fundraise for something like this they way I would want to. So we agreed this was the beginning of a good conversation to be continued for a future Kona. 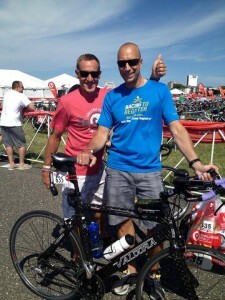 This entry was posted in ironman, motivation and tagged atlantic city, challenge atlantic city, chris mccormack, delmo sports, frank day, remissionman, rob vigorito, stephen brown, stephen delmonte, team in training, tom knoll, whit raymond. Bookmark the permalink. Both comments and trackbacks are currently closed.